Since 1992 I was every year in Nový Jičín for 3 consecutive years. In these years I was present in Nový Jičín, the town of my birth, every year. My brother Shragga instituted a prize at the Nový Jičín gymnasium for pupils who wrote essays every year on any Jewish subjects. The object was to teach awareness among the Czechs of what occurred during the Shoah. The 3rd year 1994, the gymnasium requested that the prize should continue for pupils to write on any subject. By this time Shragga had died and his widow said that the prize should continue dealing with Jewish subjects as constituted by Shragga in 1992. The professor who was administering the scheme said that making the essays be written only on Jewish subjects was racist. My sister in law took offence and the scheme was unfortunately stopped. I had spent four years from 1938, the occupation of the Sudetenland, till 14th Sept. 1942 in Valašské Meziříčí and started my Shoah on that fateful date. Valašské Meziříčí is different from Nový Jičín in that it was always a Czech town and to some extent the relationship to Jews was more relaxed than in Nový Jičín which had a majority of its population German. The fact that the above site was posted on the internet helped me to persuade the town council in 1998 to consider putting up a memorial to their neighbours who were killed. I started the work of making the list of the victims in 1994 and by 1998 I took the list to the Mayor to put to him what I thought was the town’s obligation. I said to him that the Germans killed the people on the list which includes two of my brothers and my mother, but that the town of Valašské Meziříčí killed any memory of these Jews who were neighbours of the townspeople of Valašské Meziříčí. The circumstances are that during the communist time and the Slansky trial in the 1950s there was more or less official Anti-Semitism although this was actually illegal in communist states. But during this time Valašské Meziříčí demolished the synagogue to make way for a fire brigade station which, in the event, was never built. But they also demolished the Jewish cemetery. Not only that, in 1945 there was a battle for the town and approximately 250 German soldiers, many of them from the SS fell during the attack by the Red Army. The Red Army had a simple rule about enemy dead. Each was buried at the site where he fell. This meant that there were 250 graves scattered throughout the town. The Russians made a map and a list, based on the tags of the fallen soldiers and gave the data to the new Czech mayor. The then German Democratic Government came up a few years later and wished that the German fallen should be buried in a military cemetery somewhere on the outskirts of the town. The good people of Valašské Meziříčí were then represented by a communist town council and they decided to bury the German dead at the site of the demolished Jewish cemetery. The town council also lost the map so that each individual soldier could not be identified with the details on the Red Army list. The town council and the GDR decided to make a mass grave for the about 250 skeletons. A bulldozer dug through the Jewish graves to make a large excavation, but then due to rain the sides of the excavation collapsed. To solve this problem the town council decided to use the bricks from the surrounding brick wall of the Jewish cemetery to reinforce the excavation made. The GDR paid the town council 1250 DM for every German skeleton reburied. By the time I came to the site with the mayor in 1998 there was a very tall wooden cross at the top of the rise of the erstwhile Jewish cemetery site. The cross overlooked about 250 small individual crosses with the names of the German dead. In 1994 I discovered 12 Jewish gravestones which were hidden there in a thicket at the site by the protestant pastor, a Mr. Žilinski who was given orders in the 1950s to clear the cemetery. He did not feel too comfortable about the task but as he said to me in 1994 he had to obey the instruction lest he should find himself in a communist jail. The 12 gravestones he arranged secretly in the shape of the Star of David to indicate to the Almighty that this was once consecrated ground of a Jewish cemetery. I already knew the above story from my searches at the archive of Vsetín, but the desecration shook me. The mayor started explaining to me that the town intend to create on the site of the Jewish cemetery an international park of remembrance which in its midst would have a holocaust memorial to the Jewish victims during World War II. He told me that Turkey had already agreed to commemorate their dead from world war I who died in a Valašské Meziříčí hospital. He continued that the town council is in touch with Russia also to build a memorial to the Russian fallen of World War II. He said that the dead will not feel their differences if they are all together. It took the town council another four years, up to 2002, to decide that they should erect a memorial to the Jewish victims of the Holocaust on the site of the demolished synagogue in the middle of town. This proposal I accepted and by 13th Sept., 2004, 62 years after our deportation I unveiled a memorial which the town had erected. The demolition and subsequent desecration of the Jewish cemetery now cannot be undone. In 1990 I first visited Valašské Meziříčí during the velvet revolution when the communist government in Czechoslovakia fell. I was shocked to see that we had completely disappeared. There was no sign anywhere that we ever lived there. Four years later I was searching for data to make a list of the Jewish people who were killed during the German occupation. The archive of Valašské Meziříčí is actually in Vsetín, the district town some 10 Km south of Valašské Meziříčí. The director of the archive a Dr. Ladislav Baletka was very supportive of my work, he is also a member of the town council and by 1998 when I finished the list he introduced me to the then mayor Ing. Bohdán Mikušek. Representatives of the Jewish Community of Ostrava. Michael Honey signing the Yizkor Book written by Dr. Ladislav Baletka for His Excellency the Israel Ambassador Artur Agmon. On 14.9.04 it will be the 62nd anniversary of the transport of the last of the Jews who left Val. Mezirici to the ghetto Theresienstadt. JUDr. Karel Heller, president of this community, his wife Ani, their two little girls Jana and Mira together with their grandmother on the mother’s side Rosa Flach née Hoffman, Gen.5 from Karvina were specially kept back for one month. One evening the road of their house was sealed off and all people were advised to stay indoors. The family was loaded onto a truck and taken to Ostrava. The family without Ani was included in the next transport to Theresienstadt. Ani was taken separately straight to Auschwitz and killed. It is not known what trespass Ani committed to deserve such special treatment. We can only assume that it was some important act of resistance. I prepared a listing already in 1994 of all victims of Valasske Mezirici and asked the town council to commemorate these neighbors from this small town in Moravia, Czech Republic where all of them disappeared. The communist authorities of the town demolished the synagogue and the Jewish cemetery in the 50s during the Stalinist anti-Semitism at the time of the infamous Slansky process. Thus communism completed the Shoah which the Germans started. The Germans killed the people and the Czech Communists obliterated all traces of them. But the town council decided to try and make good the wrong which they committed. 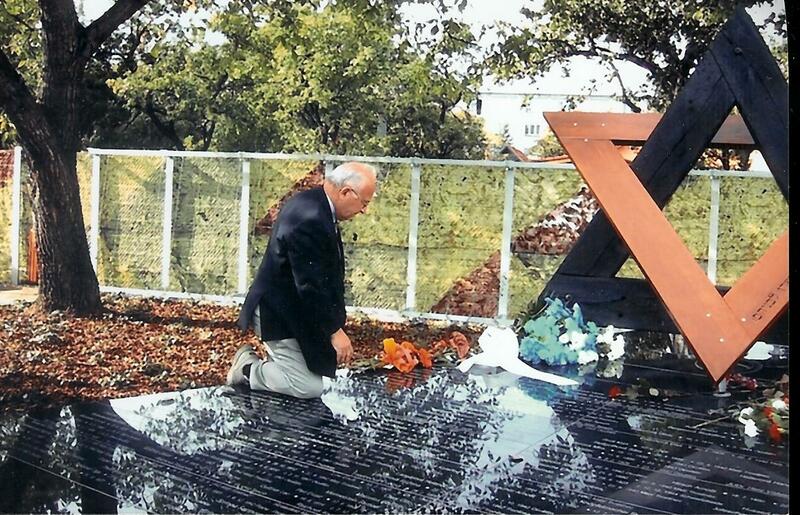 On 14th Sept., next I will be unveiling a memorial to the victims of the Shoah on the site of the demolished synagogue. 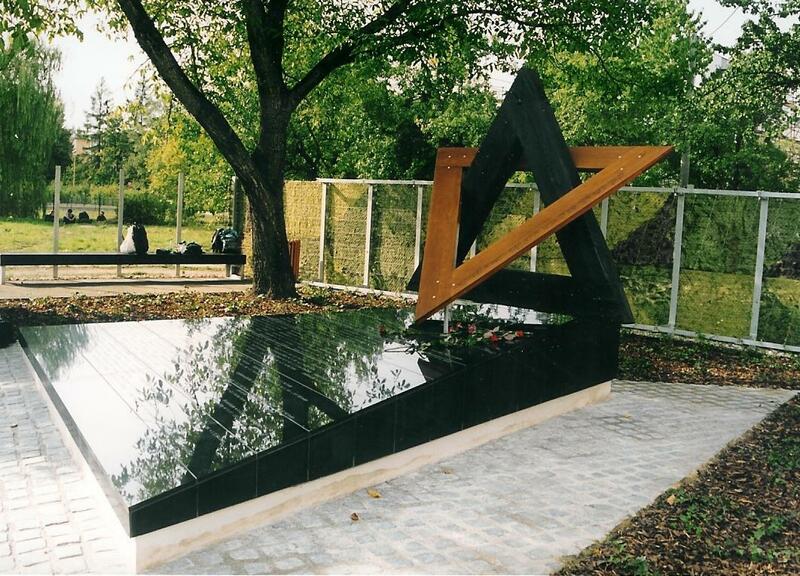 The memorial will bear the names of the victims and the inscription used at Yad Vashem for the Valley of the communities; Psalm 78, verse 6 first in Hebrew and then in Czech: למען ידעו דור אחרון בנים יולדו יקומו ויספרו לבניהם "In order that the last generation will bear children, arise and tell their sons." Hereunder is a list of the Jewish victims who perished in the Shoah from the Community of Valasske Mezirici. It was prepared by Michael Honey (formerly Misa Honigwachs), a survivor. The research of data showed how the Germans organized the Shoah in the Protectorate. Mr. Honey writes that he is sure that Valasske Mezirici is a typical example of how they did it. In the list you see how in the period March 1939 to Sept., 1942 the Germans removed young and capable people, all professionals, teachers and the like, also many of the rich. These were a phase 1 elimination at the early time when the mass gassings were not yet in full swing. The people died individually in various concentration camps and urns of ashes would arrive back with the sad news that the individual died. From May 1942 to Sept. 1942 all young people were billeted at the Zemsky Statek Branky (District Farm of Branky) for agricultural work. Branky is a village about 4 Km west of Valasske Mezirici. We only know one survivor of a group of about 40 people, all the others perished. On 12th Sept., 1942 the rest of the community were shipped to Terezin. Most were the aged and children. When I first arrived in England in 1945 and started to learn English I was 16. I read the question posed by Hannah Arend; "How could 6 million people go to the gas chambers without resistance?" At that time I could not begin to answer this question, but now I begin to understand partly through the research on the list enclosed. Altensteinova Adolla 20-Jul-25 ?? ?? Bacova Rosa 20-Oct-16 12-Sep-42 25-Sep-42 Maly Trostenec " " N.V.
Beer Walter 07-Jun-00 12-Sep-42 25-Sep-42 Treblinka " "
Formanova Laura 18 Sep. 1885 ??? 20-Jul-43 Terezin Husova N.V.
Hellerova Mira 19-Nov-35 30-Sep-42 08-Mar-44 Auschwitz " " " "
Hermannova Edita 18-Nov-05 12-Sep-42 25-Sep-42 Maly Trostenec Petrkovice/Lesna N.V.
Hermannova Vilma 28 Jan. 1894 05-Dec-42 26-Jan-43 Auschwitz Jicinska 476 " "
Hirsch Dr. Bruno 18 Dec. 1891 12-Mar-40 03-Nov-40 Buchenwald?? Vsetinska 80 Left Vset. Jail 30th Mar. Jancova Adela 02-Apr-03 12-Sep-42 25-Sep-42 Maly Trostenec Val. Bystrice 363 N.V.
Joleschova Jana 28 Feb. 1891 12-Sep-42 25-Sep-42 Maly Trostenec " " "
Knepfelmacher Ernst 14 Jan. 1892 ??? 12-Jun-41 Auschwitz Zasovska 77 "
Knepfelmacherova Alice 9 May 1921 12 June 42 9 Mar. 44 Auschwitz " " "
Levyova Berta 4 July 1866 12-Sep-42 25-Oct-42 Treblinka Vodni 57 N.V.
Lischkova Rosa 22 Feb. 1883 12-Sep-42 25-Oct-42 Treblinka Husova 365 N.V.
Braun/Londonova Hilda 16 Mar. 1914 13.Ju ly 43 08-Mar-44 Auschwitz " " From Prg. to Ter. mar. Reichova Eliska 6 Feb. 1863 26-Sep-42 09-Oct-42 Terezin Sklarna N.V.
Reichova Angela Lilly 01-Dec-01 26-Sep-42 12-Jul-43 Terezin " "
Schenfeld Dr. Moric 26-Jun-03 12-Sep-42 ??? 1945 Auschwitz Vsetinska 599 March from Ausch. Singer Emil 30 Apr. 1884 12-Sep-42 ??? 1945 Auschwitz Fugnerova 765 N.V., March frm A.
Theinova Olga 27-Jun-20 12-Sep-42 25-Sep-42 Maly Trostenec " "
Toch ??? ?? 1939 ?? Toch Karel 28-Aug-28 12-Sep-42 25-Sep-42 Maly Trostenec " " "
Toch Ivo 31-Oct-28 12-Sep-42 25-Sep-42 Maly Trostenec " " "
It was an extermination camp at which hundreds of thousands of people were killed in the years 1941 to 1943. It operated similar to Chelmno in that the people were put on lorries at a railhead and driven to the camp. The lorries had the exhaust directed back into the space of the lorry so that by the time the lorries arrived at the camp the people were asphyxiated. Those lorries of Maly Trostenec were meant for me. But I was saved by my brother Leo and Freddy Hirsch, the Maccabi Hatzair youth leader who was murdered by Jewish prisoners who were being saved by Mengele when the September transport to the Familienlager was liquidated. Source: Dr. Robert Rozett and Dr. Shmuel Spector, Encyclopedia of the Holocaust, Yad Vashem & Facts On File, Inc. , 2000. Village in eastern Byelorussia located 7.5 miles east of Minsk; camp and site of mass murder of Jews. About 200,000 people were murdered in the Trostinets area. About 65,000 were killed in Maly Trostinets, including over 30,000 from the last major aktion in Minsk. Between July 28-31, 1942 and on October 21, 1943 the last Jews from Minsk were murdered and buried in Maly Trostinets and Bolshoi Trostinets. 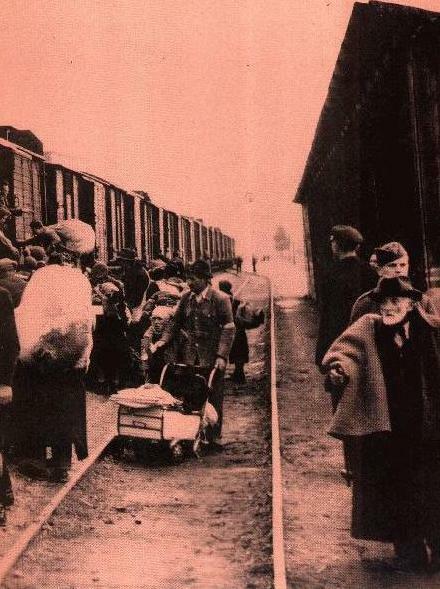 During 1942, Jews from Germany, the Netherlands, Poland, Austria, and the Protectorate of Bohemia and Moravia were brought by train to be killed in Maly Trostinets. Most of the victims were lined up in front of large pits and shot. Tractors then flattened the pits out. The prisoners in the camp were forced to sort through the victims' possessions and maintain the camp. They occasionally underwent selections. This happened more frequently during 1943. In the fall of 1943 the Nazis begun to destroy all evidence of mass murder by burning bodies in the nearby village of Blagoveshchenie. Soviet Prisoners Of War were forced to rake through the ashes looking for gold. As the Soviet army approached in June 1944, the Germans killed most of the remaining prison­ers. On June 30 the Germans completely destroyed the camp. When the Soviets arrived on July 3, 1944, they found a few Jews who had escaped. "Here in the area of Trostinets the Germans murdered and burnt 201,500 souls, peaceful citizens, Partisans and Soviet P.O.W." Many families sent some of their members away in order to avoid the German occupation only to be caught elsewhere and those were deported and killed just the same. Meisel Dr. Leopold, b. ? ?, his wife Gertrud Meisel (née Heller), b.17th Jan. 1891 in Valasske Mezirici, elder sister of Dr. Karel Heller, their son Gerhard Meisel, b. Vienna 9th Sep., 1915, their daughter Tereza Meisel, b.Vienna 22nd Sep., 1919. I have checked the Terezin cards, deportees from France and from Holland and this family does not appear to have fallen into the clutches of the Germans. This means that they may have survived the Shoah by leaving the Netherlands. I am looking for this family as I need to make sure that their names should not be included on the above list of victims who were killed. Does anyone knows the whereabouts of this family??? I wrote the above in 1999 when the website was first listed. I had no people contact me with information. But I kept looking. In July 2001 there was an international conference of Jewish Genealogy in London. I then lived in London and gave one of the conference lectures. During the intervals between sessions of the conference there was an area for rest and coffee. I sat down at a table with a Rene Van Wijngaarde from Holland, I did not know him. He was visiting the conference from Holland. As we chatted I told him the above story because it concerned Eindhoven in Holland and I complained how nobody came forward to solve the riddle of the whereabouts of this Family Meisel. I have done several years of research in order to establish a list of Jewish victims of the holocaust who were from Valasske Mezirici in Moravia, the former Czechoslovakia. This town is like many in Europe that has lost its Jews entirely. I have been further looking into some younger members of families who attempted to leave. One such family originated from this town and moved to live in Vienna. In 1938 when the Austrian ‘Anschluss’ occurred they took refuge back in their home town. Discerning the danger to Czechoslovakia they left for Eidhoven. The data comes from police files of arrival/departure registrations in Valasske Mezirici. Shortly after their arrival in Valasske Mezirici they are registered as departing for Eindhoven on 8th June, 1938. I wonder if in the Netherlands there was or is also the registration of people arriving and departing as is still the rule now in the Czech Republic. I have checked the various memorial books and this family do not appear to have been deported by the Germans. I wonder if your records show how this family left Eindhoven. According to the registration in Eindhoven, the fam. Meisel came to this city on 14 Feb. 1939. Leopold was born on 17th Jan. 1880 in Zlin (Czechoslovakia). The family departed on the 2nd May 1939 for Cambridge (England). This is the first confirmation which I had that this family were victims of the Shoah, but that they managed to escape deportation by the Germans. All over Europe there are police registrations of movements of people, but not in England and not in the US either. Now how to look for them after 61 years? I decided on the telephone book. I started to look up past records of numbers in Cambridge to no avail. Refugees arriving in England in 1939 were not likely to have a telephone registered in their name. But during fiddling about with the phonebooks the helpline said to search for the name in a bigger region than just the town of Cambridge. So just for the heck of it I put in Cambridgeshire. Lo and behold I got a number in Bedford for a family Meisel. I rang the number and a little girl answered, I asked her if I could speak to her daddy. She said no, he is away playing golf and will not be home till tomorrow. So I asked her if I could speak to her mummy. She said that mummy is cooking in the kitchen and that she will call her. Mrs. Meisel came to the phone and I first apologised for talking to her little daughter. At the time there were all kinds of stories circulating in the papers about paedophiles telephoning like this. I explained the above circumstance and asked if her husband was Gerhard Meisel. And to my utter surprise she said no, but Gerhard is my father-in-law, he is my husband's father. I timidly asked if she would have Gerhard's telephone number and address. She answered in the affirmative and the utter wonder is that Gerhard actually lived a few miles from me in Edgware, in north London. I spoke to Gerhard and from him got the details of the family Meisels relationship to the Hellers in Valasske Mezirici. Now for this you have to open the attached genealogy of the Flach family. The people listed with red background are victims who were killed by the Germans in the Shoah. If you scroll down having opened the above attachment a quarter of the way down you will find my family. In 1994, having discovered the twelve gravestones hidden on the site of what used to be the Jewish cemetery in Valasske Mezirici, I came home to England. My parents-in-law, who used to live in Haifa after the war, were just visiting. I told the story how I rediscovered the fate of the Heller family because someone had hewed into the plinth of the gravestone of Salomon Heller the names of the family of JUDr. Karel Heller who was, at the time of our deportation 14th Sept., 1942, the president of the Jewish community of Valasske Mezirici. When I mentioned who they were one by one I came to say Ani Heller. And my father-in-law started saying: "Ani Heller? Ani Heller, married to the lawyer JUDr. Karel Heller? Why she was my cousin, the daughter of my uncle Viktor Flach and my auntie Rosa. It was then that we sat down and I drew the Flach Families Diagram by the method I have developed for many other diagrams of The Jewish Historical Clock. Gerhard filled in for me the information on the Heller family which is shown half way down the diagram. The Meizels family were from Zlin in Moravia, Gerhard's grandfather on his father's side lent Bata money after the Ist World War when Bata started to produce sneekers. The business became very successful and the firm Bata became a world wide concern. Bata kept up friendly contact with the Meisel family as the business grew. Leopold Meisel became Finance Director at Bata and the firm also employed his brother Siegfried. The office for the Finance Dept. of Bata was in Vienna. At the time of the Anschluss of Austria in 1938 Leopold fled to Zlin and his family came to Valasske Mezirici. The reason they left for Eindhoven was that Bata was relocating his busines to Holland feeling that Czechoslovakia was endangered by Hitler. When in May 1939 Bata saw that Holland was also not safe he transfered his business to Canada. But Bata kept faith with his eployees and obtained visas for Leopold and his family to the UK and for Siegfried to South Africa. I came to discuss with Gerhard his cousin Hanus Meisel, who like him and his family was missing from the many lists of victims which I had analysed. I told him the fate of JUDr. Bedrich Heller, his wife Marie Heller and their son Hanus Heller. I found this family also on the police registrations of departure from Valasske Mezirici. But they went to Prague and I found them to have been deported with the second transport from Prague to Lodz. That led to their killing in Zamość. Hanus' parents obtained for him a student visa to leave for the US. Also with the help of Bata. In 1940, when Hanus left Prague he was 18. In 1992 my brother Shragga organized a get together of survivors of the Shoahh from Novy Jicin, Czechoslovakia, the town where I was born. Just before the meeting Shragga telephoned me that he was too ill to attend and he told me to take over his arrangements. Shragga had a heart bypass operation and he also had diabetes. Veins which were taken from his foot to replace his blocked arteries worked fine, but the wound left by the operation on his ankle would not heal because Shragga had diabetics. Shragga died a year and a half later. Novy Jicin was in the Sudetenland and is in Moravia. In late September 1938 our family fled the town as refugees some 15 Km south to Valašské Mezirící. During the meeting in Novy Jicin in 1992 I was staying with a Czech school friend in Valašské Mezirící. Now the two towns are only 20 minutes apart by car, but for me, in the period 1938 to 1942, Novy Jicin could have been on another planet. During the German occupation of Czechoslovakia Jews were anyway not allowed to travel for most of that period. Novy Jicin became part of Hitler's Reich because it is located in what was then termed the Sudetenland and the border to the Czechoslovak Protectorate was, to all intents and purposes closed. Whilst staying with my school friend I got the idea to research a list of the forgotten dead of Valašské Mezirící more or less to emulate my elder brother. In all of these places we survivors have the feeling as if we never existed. During the rule of communism most Jewish cemeteries were demolished, even the stones were taken into nationalized stone mason establishments and recut for the new dead of the Czech population. In most cases synagogues were similarly bulldozed to make room for grey apartment blocks or schools. I quickly made discoveries some of which evoked my memories. I attach a file which contains an article published in Shemot, the journal of the Jewish Genealogical Society of Great Britain (Vol.2, No.1, Jan. 1994). The file also contains a note which I wrote on 16th Sept., 1993 which demonstrates how we are influenced by this absence of our heritage. Both the children were killed with their father and grandmother on 8th March 1944 in the extermination camp, Auschwitz, Birkenau. Mira was not quite 7 (her name means peace). Hana was 5 1/2 , I met them only once about a year and a half before their deaths. The roses which Mrs. Heller had arranged to be wrapped up in straw for the winter of 1942/43 before our arrest had probably made it through that winter. List of the BH transport Ostrava to Terezin which arrived there 18th Sept., 1942 obtained in Prague. List of the Jewish Community of Valasske Mezirici prepared by Dr. Karel Heller who was the last president of the community. The list was obtained from the Valassko District Archive in Vsetin. Copies of the Terezin cards for the applicable people from Valasske Mezirici obtained from Prague. Listing of arrests by the GESTAPO for Valassko prepared by Dr. Ladislav Baletka, the director of the district archive in Vsetin. The GESTAPO destroyed its files before the defeat of Germany in 1945, but when they arrested people they were held in the Vsetin jail. The jail kept accounts because they were paid a fee by the GESTAPO for every night a prisoner was kept in the jail for them during interrogations. It is these accounts that have been preserved in the archive of Vsetin. Police records of prihlaseni/odhlaseni (entry/exit) from the domicile in Valasske Mezirici. This added a number of people to the list. When movement was still permited up to mid 1940 many people left with various motives. Most of these were later picked up by the sweep of the GESTAPO throughout the Czech protectorate and their fate was traced either in the Terezin book or on the cards either in Prague or at Bet Terezin, Givat Chaim Ichud, Israel. The GESTAPO lifted all the files of those they arrested but left those which moved away for one reason or another. * Dr. Ladislav Baletka, Director of the district archive of Vsetin. * Eugen Stein of Prague a genealogist with whom I had been exchanging data for many years. * Mrs. Reichenthalova who looks after the Terezin card index at the Prague Jewish Community. * Alisah Schillerova who has worked for many years at the archive at Bet Terezin, Givat Chaim Ichud, Israel. * Jacov Tzur (formerly Kurt Cierer) of Ostrava who looked up for me many queries and found for me data on the death of my brother Emanuel Honigwachs, this after 54 years have elapsed. Without their assistace the work could not have been done. I must return to the quoted paragraph above. The tabulation in the second enclosure shows that the two children were killed in Auschwitz about a year and a half later than I stated in my article. In doing the research it was discovered that the card for Mrs. Anna Heller, the wife of Dr. Karel Heller was green and Mrs. Reichenthal pointed out that in many cases these cards were sent by the local GESTAPO in lieu of the person indicating as they do that the person has already been dealt with. It was then that I realised that Mrs. Heller was arrested with her family sometime between 12th and 30th Sept., 1942. Her husband, her mother and children were shipped to Terezin on 30th Sept., 1942 where they stayed till Sept., 1943. They were shipped to the Familienlager (Family Camp) of Auschwitz/Birkenau and gassed during the night of 7th to 8th March 1944 when the ill fated September transports were all killed. Mrs Anna Heller was not sent to Terezin, she was taken to the GESTAPO in Ostrava and sent directly to Auschwitz where she was gassed on 31st Oct., 1942. What she did or what she was accused of we may never know. As I write in the article in the first enclosure I met Mrs. Anna Heller only once just before the 14th Sept., 1942 when I delivered a letter from my mother to Dr. Karel Heller, her husband. As coincidence would have it my wife Eve Honey née Flach is a second cousin once removed of Mrs. Anna Heller, as I saw her an ordinary housewife with two small children, but an Eshet Chail of our nation. It is possible to demonstrate from the tabulation the policies which the GESTAPO applied in order to render us completely powerless during the Shoahh in the Czech protectorate. In 1941 he was a healthy man of 43, the Gestapo regarded him as the head of this well to do family who had been in Valasske Mezirici for a long time. The family had been running several businesses in the town. He was arrested on 10th Feb., 1941 taken to Auschwitz and 19 weeks later he was dead. Note that the remaining family of three were all arrested before the 14th Sept., 1942 and all were similarly killed. In 1941 he was a healthy man of 31, the Gestapo held about 40 young and able Jews from Valasske Mezirici and from Vsetin at the Kinski Farm in Branky for agricultural forced labour, thus removing them from their families and depriving them of their freedom of action. They were under guard and strictly supervised. Branky is a village about 5 km west of Valasske Mezirici. The Beer family lived in Branky. Arnost socialised with the people who were thus interned, he was arrested and interrogated at the Gestapo in Vsetin for about two weeks, he was then sent to Auschwitz, 7 weeks later he was dead. His elder brother Walter was left to look after their 70 year old mother. Mr. Joseph Berger was on the council of the Jewish Community of Valasske Mezirici . He had a shop selling fashion furs on the town square in the prime position right next to the town hall. On Wednesday 15th March, 1939 I was on my way to my friends the Tochs (both are on the list of victims). As I got to the bridge I was held up by a convoy of military vehicles. In them were soldiers dressed in green uniforms, I was 10 years old, I had no idea who the soldiers were. Indeed this was the first time I had seen a motorised military column. Curiosity made me follow the column to the town square where the column stopped and the vehicles were parked. Nothing seemed to be happening. But from passers by I heard that the army were Germans. I was under the arch almost opposite the Town Hall. I saw some officers go into the shop, a few minutes later they each came out with a fur on their arm. Successively groups of officers and then soldiers went into the shop, I was loitering about with other children and a grown up came and told us to go home. It was only when I was making the list that I discovered that during the following night Josef Berger committed suicide. He was just the first victim of the German occupation. Later during the time of my incarceration I saw the looting of our property which was an integral part of German policy and here was an event which typifies the progress of the Shoah. In 1941 he was a healthy man of 20. Here is another young man, Otto died after six months. That is a measure of it youth and stregth helped, but the conditions were such that almost all the early prisoners died. Prof. Frank was a teacher at the Valasske Mezirici gymnasium, a friend of Petr Jansa's grandmother. Petr is a friend from before the Shoah and we are still in touch, in his living room he has a painting made by Prof. Frank when he was living in retirement. Prof. Frank obtained a permit to move to Prague, but the Shoah caught up with him there and he went on the transport No. 5 to Lodz. We do not realy know whether he was shipped to Auschwitz. Possibly he died in Lodz due to his age. He was 55 at the time of his deportation. These were parents of Hanus Heller whose story I already wrote about above. Hanus their son was saved from the Shoah but they were deported to Lodz on the transport No.5 just as Prof. Frank above but they are known to have been murdered because they left Lodz for the extermination camp Zamosc. Gestapo Arrest after 14th Sep.42!!! I already described the deaths of this family above Ani Flach was probably taken to Auschwitz seperately because of MUDr. Arthur Flach, her brother, he escaped to England where he was a medic in the Czech air force. He returned to Prague after the war and it was probably he who had the details of the above people inscribed on the plinth of Salomon Heller which I found in 1994. I do not know the reason why the Gestapo interrogated Alfred Hirsch, aged 55 for three months in Vsetin. It may have been his relationship with Bruno Hirsch, see below. left Vset. Jail 30th Mar. Bruno Hirsch was 49 when arrested. The pattern repeats, he was taken to Buchenwald and died. What did he tell the Germans in Buchenwald that they got hold of his elder brother two days later? Are these important questions, certainly they are, but there is no way to find out the answer? All the witnesses are dead. This is my brother Leo, he was president of the Zionist Student Society in the Czech University in Brno, he was a leader of Makabi Hatzair before that. He had the contacts and he had the capability to do something. He went to Prague and there he found that the Germans, mainly Eichmann talked with his seniors in the Zionist movement into cooperating to build the Ghetto Theresienstadt. A thousand three hundred and sixtyfive young men were bamboozled by German promises that the families of these people would be protected. The people of the Aufbaukommando transports to Theresienstadt, over a thousand of them, found on arrival that they walked volontarily into a jail. Of these capable and young people less than 25% survived. The Germans of course reneged on their promise to protect the families. The Knöpfelmacher family sought to protect themselves by conversion to Christianity, Ernst Knöpfelmacher and his children of the first marriage to a Jewess were also converted. Ernst or Arnost in Czech married a second time a Czech Christian woman. All that was irrelevant to the Germans who acted in accordance with their own race laws. The problems of Leo and Alice were political membership of the local communist youth movement. Hence the early arrest of Leo followed by his death. The two seniors aged 59 and 48 respectively at the time of their arrests had a home removals business which owned trucks. They objected when the trucks were confiscated as the Germans needed them to move armaments to the Russian front. Rather then consider return of the trucks they arrested the owners and eliminated them. This lawyer Karel Levy was 38 at the time of his arrest. His elimination is typical to the pattern which emerges. Every young and potentially dangerous opponent to the German regime is eliminated so that the rest of the family become defenceless. These two Meiseles families were refugees from Poland whom JUDr. Karel Heller protected. Perhaps they were related to the Meisels family from Zlin. But it appears that the Germans extracted information on these families when they interrogated both Mr. and Mrs. Heller. It is difficult to imagine the resistance of the two Hellers. The Gestapo had their small little girls as hostages. The Gestapo arranged for the grandmother Rosa Flach to come from Karvina to Valasske Mezirici to look after the two children whilst the parrents were under interrogation. The grandmother then stayed with the children right into Auschwitz where she was killed with them on the fateful 8th March, 1944 which was the killing of the September transport to the Familienlager. Indeed I wish I knew why Rudolf was eliminated first? This was the Kantor who arrived in the town toward the end of 1940 with his sister. In Sept., 1940 the Germans announced a new regulation prohibiting Jewish children to be taught in the public school system. In large towns such as Prague or Ostrava there were Jewish schools which continued, but in small towns such as Valasske Mezirici there was a straightforward prohibition. My mother was very worried by this prohibition and she organised for several children to be taught privately by Ing. Erich Reichenbaum who with his wife Selma and stepdaughter Ruth Eichenbaum and her mother Arnostka Friedetzka came to shelter in Valasske Mezirici. My mother convinced him to give us lessons at the synagogue. His stepdaughter Ruth was my age and she attended the lessons as well. The Reichenbaums with the grandmother lived in an apartment in a building on the town square opposite the town hall. The Gestapo wanted the apartment and got to hear of the lessons he was giving. They called him to Vsetin and gave him a warning that it would be best for him to return to Ostrava with his family. Just then Samuel Mermelstein and his sister arrived from the Carpathia region of the former Czechoslovakia. My mother was not put off by the departure of the Reichenbaum family. She soon organised that the Kantor gave us lessons. The Kantor also held Shabat services a couple of times. When the Gestapo heard of this they called the Kantor to Vsetin, told him that all assemblies of Jews are forbidden, the Kantor maintained that he taught the children handicrafts and household trades. On his return services stopped, but the lessons continued with the pretence that we were learning sewing. We actually had sewing lessons so that he could demonstrate that we were indeed learning household work. I can still darn socks, do ironing, some cooking from that period. His sister took the Gestapo visit as a warning and departed back to Carpathia. After about three months of lessons Samuel Mermelstein was arrested and six weeks later an urn of his ashes arrived in Valasske Mezirici. I do not know what happened to his sister. But Ing. Erich Reichenbaum and his wife Selma survived and I met them in Tel Aviv in 1949. Their daughter died in Theresienstadt of complications from jaundice, the grandmother was killed in Auschwitz. These two young men were brothers, aged 36 and 27 respectively were members of the local communist party. They were arrested as politicals and faced the inevitable end following such incarceration. The Small Fortress of Theresienstadt was a particularly brutal prison. I include these two women mother and daughter, aged 79 and 41 respectively for two reasons. The first is that they lived in a villa at the Glassworks. They were the last of the Reich family who developed the manufacture of glass in Valasske Mezirici. Even today this is still the biggest employer in Valasske Mezirici. In the book on the Jews of Valasske Mezirici Dr. Baletka writes about their ancestor Izák Hirschel on p. 12 of the book. He came to Krasno/Valasske Mezirici in the second half of the 18th century. At this time the Familianten Gesaetz (Familianten Law) operated which prevented Jews from settling in the lands of Bohemia and Moravia. In order to get round this law Izák Hirschel negotiated with the noble family Kinsky, there is a chateau in Krasno to this day which once belonged to this Austrian noble family. The farm I mentioned in Branky where 40 young Jews were interned for agricultural work before the 14th Sept., 1942 also belonged to this family. Izák Hirschel proposed to manufacture pot ash (two words) on the land holdings of the Kinskis. At the end of the 18th century the first patent was granted in the U.S.A. for the manufacture of pot ash which had wide use in industrial England at the time and one can trace the origins of the Corning Glassworks in the US to the same manufacture of pot ash in New England U.S.A. as the manufacture which Izák Hirschel proposed to start in Valasske Mezirici. Actually the manufacture method proposed was already known in ancient Egypt. It consists of disolving wood ash in a kettle and then boiling off until there is a residue. The resulting black gunge was called pot ash. Now this organic pot ash has been replaced by potash disolved in various waters such as the Dead Sea in Israel. Pot ash or potash is a useful constituent of glass manufacture. Glass is made by heating silica sand but with the addition of pot ash or potash the melting point of sand is reduced from 2000 degrees C to about 1000 degrees C. At any rate it was Izák Hirschel who brought this technology to Valasske Mezirici and this manufacture of glass made the Reich family, his descendants, immensely rich. But the Reich family wanted not just riches but also public recognition. They converted to the Christian religion. In the archive in Vsetin there is preserved a letter written by the senior Mrs. Reich to the Gestapo pointing out the conversion to Christianity. As with the Knöpfelmacher family this type of letter held no sway whatsoever with the German race laws. Mrs. Reich expresses herself particularly harshly about these dirty Jews with whom she has determined not to associate with. But she was shipped to Theresienstadt where she soon died of lack of food and heating, and her daughter suffered the inevitable fate of the Jews in Auschwitz. Here we have yet another man of 52 in the prime of his life plucked away from his family and find him to die after about six weeks of the privations in the concetration camp Auschwitz before any gas chambers were used for the mass killings of the rest of Jewry. Here we have yet another convert. For some reason the Germans left him alone till June 1943. Then having forgotten him they sent him by Einzelweisung to Auschwitz where the apparatus finished him off just the same. The above makes 25 young, talented, proffesional or rich persons who could have organised something called resistance. All of these people were removed from the town before the mass deportation of 14th Sept., 1942. That is about 15% of the total population. In 1945 I arrived in England to join my father who had been in London since February 1939. He sent a visa to all of us follow him, but in August 1939 my mother decided to wait till after the holidays. At any rate that is the explanation she gave us. My dad translated for me some of the writings of Hanna Arend which were reported in the press in England. In 1945 she was asking the question which everybody was asking. "How come that millions of people went into the gas chambers without resistance?" I knew the degree by which we were softened up for the killing but not so that I could back it up, it would be just my say so. The above analysis can be taken to represent a macro picture to what was happening all over Europe. It shows the degree of premeditation of the murder which the Germans perpetrated. It shows how the young and capable were removed from us first so that by the time the mass extermination came we were just women and children accompanied by the aged. The Shoah was a terrible thing. For more information read Michael Honey's article which was published in SHEMOT, Journal of The Jewish Genealogical Society of Great Britain, Vol. 2, No. 1., January 1994. ...I write it down to identify who we are and to ensure that we are not forgotten. Do we desire, in that respect, to emulate the gods? Survivours of the Holocaust have an even greater need to record their memories. We have the naive notion that we have a message to humanity, to ensure that such events do not occur again. The message, it appears, does not reach the evildoers, for there are further mass murders which have occured; granted, none have been as thorough as the Germans. I started my article in Volume 2, Number 1 of the Journal SHEMOT describing the actions of my brother Shragga, may he rest in peace, in arranging a meeting in 1992, in Novy Jicin, Czechoslovakia of the survivours of the Jewish community to place a commemorative tablet on our synagogue building in order to remind the town that we were there. The Holocaust has been successful in almost obliterating all traces that we ever existed. That meeting in Novy Jicin was obviously not enough for my brother. He felt that a more positive memorial was required, one that lived rather than a taof stone. Shortly before my brother passed away he arranged a competition at the Gymnasium in Novy Jicin for annual cash prizes to be distributed to the pupils of this school who write essays with a Jewish theme. As our traces are few the pupils, for the most part have never met a Jew. I have just returned from the 1st annual award ceremony. I am pleased to translate the essay which won the prize, it was not only an excelent essay, but it was also a work entirely original in the search for historical source material.